For connections of chain and attachments (Not for overhead lifting). WARNING: DO NOT exceed working load limit. Forged steel, hot dipped, galvanized. Open-throat design, wide bow, screw pin shackle requires no tools to assemble. Slip screwdriver blade or hand punch through pin/eye and tighten. Meets Federal Specification RR-C-271F, type IV, Class 2. WARNING: Inspect regularly. Replace if worn, distorted or damaged. Ensure pin is fully engaged. Seize pin with wire. Do not exceed WLL [Work Load Limit].Use only Duty Rated Shackles, with embossed WLL,for overhead lifting. Forged carbon steel for maximum strength. Spring steel snap rings. Zinc plated to resist rust. Designed as a temporary chain link repair, use one size bigger than chain. Can be used to couple chain attachments. Do not reuse after closure. Manufactured from steel. Connections for chain and attachments. When using cold shuts with chain, use one size larger than chain size. With a hammer, drive the open end through the cold shut eye then peen the extended end to prevent opening. Note: Cold shuts should not be reused after closure has been made. Do not use for overhead lifting. 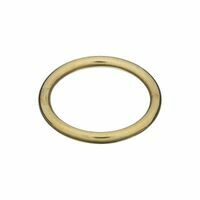 Campbell Welded Ring, NO 7 Chain, 1-1/4 in Length X 0.18 in Wire Size, Steel, Nickel Plated, 200 lb Load Capacity .
. Numerous farm, lawn, and garden and industrial applications. 2-1/4 usable inches, zinc-plated. National Hardware Ring, Series: 3156BC, 1 in, Solid Brass, 195 lb Load Capacity, For Rope, Chain and Strap WARNING: DO NOT EXCEED the working load limit. DO NOT USE for overhead lifting, to support human weight, for playground or athletic equipment, or as safety device. Numerous farm, lawn, and garden and industrial applications. Meets requirements of Federal Specification RR-C-271D Amendment 1. Shackle pins are forged from alloy steel, heat treated and tempered to give greater strength. Galvanized per ASTM A153. Design factor 5:1 Designed as a temporary chain link repair, use one size bigger than chain. Can be used to couple chain attachments. Do not reuse after closure. Manufactured from steel. Baron Spring Snap, Square Loop, 3/4 in Eye Width, 2-3/4 in Overall Length, Steel, Nickel Plated Meets requirements of Federal Specification RR-C-271D Amendment 1. Shackle pins are forged from alloy steel, heat treated and tempered to give greater strength. Galvanized per ASTM A153. Design factor 5:1 Yellow zinc plated. Used in farm, lawn & garden and other applications to secure attachments and pins. WARNING: DO NOT EXCEED the working load limit. DO NOT USE for overhead lifting, to support human weight, for playground or athletic equipment, or as safety device. High quality ASA Standard chain links. Every pin, bushing, roller and side plate is shot-peened during production to increase metal fatigue resistance. Heavy roller chain (i.e. 60H or 80H roller chain) provides extra thickness of side plates which affords greater capacity of shock load without experiencing side plate metal fatigue. Designed for lifting, pulling, mooring and other farm, marine, and recreational applications. For quick attachment. Steel Body and spring. National Hardware Ring, Series: 3156BC, 1-1/4 in, Solid Brass, 235 lb Load Capacity, For Rope, Chain and Strap Designed for fast, easy connections between two lengths of chain or for attaching accessories to chain. Hex shaped bolt for easy opening. Steel body construction. Designed to use with #1 & #2 chains in home, farm, and recreational applications. Open eye is designed to be closed with vice or hammer after attachment. Swivel eye eliminates tangling. Steel eye, body and gate. Baron Spring Snap, Bronze, With Strap Eye Forged steel, hot dipped, galvanized. Open-throat design, wide bow, screw pin shackle requires no tools to assemble. Slip screwdriver blade or hand punch through pin/eye and tighten. Meets Federal Specification RR-C-271F, type IV, Class 2. WARNING: Inspect regularly. Replace if worn, distorted or damaged. Ensure pin is fully engaged. Seize pin with wire. Do not exceed WLL [Work Load Limit].Use only Duty Rated Shackles, with embossed WLL,for overhead lifting. Factory number indicated thickness (inches). High quality ASA Standard chain links. Every pin, bushing, roller and side plate is shot-peened during production to increase metal fatigue resistance. Heavy roller chain (i.e. 60H or 80H roller chain) provides extra thickness of side plates which affords greater capacity of shock load without experiencing side plate metal fatigue. High quality ASA Standard chain links. Every pin, bushing, roller and side plate is shot-peened during production to increase metal fatigue resistance. Heavy roller chain (i.e. 60H or 80H roller chain) provides extra thickness of side plates which affords greater capacity of shock load without experiencing side plate metal fatigue. Koch Trigger Snap, Round Eye Swivel, 3/8 in Snap Opening, 5/8 in Eye Length, 2-9/16 in Overall Length, Nickel Plated Baron Double End Swivel, Strap Eye, 3/4 in Eye, Zinc Plated Drop forged carbon steel. Designed to grab a single link of chain on the side to form a loop for dragging, pulling or towing. WARNING: NOT TO BE USED FOR OVERHEAD LIFTING. DO NOT EXCEED WORK LOAD LIMIT. WARNING: Use shackles only as indicated. Shackles must be inspected for wear, distortion and damage before use. If the pin or bow is worn, distorted or damaged, discard the entire shackle and replace. DO NOT USE round pin shackles in rigging applications. Screw pin shackles should not be used if there will be movement on the pin. Movement could cause the pin to unscrew and drop the load. Always stand clear of loads being lifted. Baron Chain Snap, Rigid Open-Eye, 40 lb, 5/16 in Snap Opening, 3/8 in Eye Width, 3-1/4 in Overall Length, Malleable Iron, Zinc Plated WARNING: Use shackles only as indicated. Shackles must be inspected for wear, distortion and damage before use. If the pin or bow is worn, distorted or damaged, discard the entire shackle and replace. DO NOT USE round pin shackles in rigging applications. Screw pin shackles should not be used if there will be movement on the pin. Movement could cause the pin to unscrew and drop the load. Always stand clear of loads being lifted. Baron Bolt Snap, Round Swivel Eye, 110 lb, 1/2 in Eye Width, Malleable Iron, Zinc Plated Designed as connectors for rope, chain and strap. Manufactured from steel. Use as an adjustable replacement pin. Multiple holes allow user to cut off excess length. Yellow zinc dichromate plated Yellow zinc dichromate plated spring wire. Use For: Farm and Other Applications. Baron Quick Link, 3/16 in Chain, 1-7/8 in Overall Length X 1/4 in Jaw Opening, Steel, Zinc Plated Yellow zinc plated. Used in farm, lawn & garden and other applications to secure attachments and pins. Connections for chain and attachments. When using cold shuts with chain, use one size larger than chain size. With a hammer, drive the open end through the cold shut eye then peen the extended end to prevent opening. Note: Cold shuts should not be reused after closure has been made. Do not use for overhead lifting. Baron Trigger Snap, Round Eye Swivel, 3/8 in Snap Opening, 1/2 in Eye Inside Diameter, 2-1/2 in Overall Length, Bronze Baron Bolt Snap, Open Eye, 3/8 in Snap Opening, 3/8 in Eye Width, 3-1/2 in Overall Length, Zinc Plated Forged carbon steel for maximum strength. Zinc plated to resist rust. 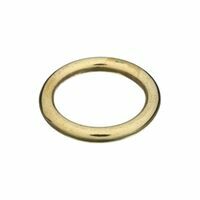 Spring steel snap ring. 2-1/8'' long with chain and cotter. Cold forged from carbon steels. Bright zinc plated to resist corrosion. 7/8" Pin diameter, 5/8" Thread diameter. Replaces Ford 230044 and MF 181777M1. Kit contains clevis, pin and cotter.180/330MI. Fits/replaces all Ford models thru 1964, 9N582 and MF20, 30, 35, 40 and 50. High tensile steel with a spring wire handle and oversized washer-head. Zinc plated. 25 percent stronger than grade 2. Use as an adjustable replacement pin. Multiple holes allow user to cut off excess length. Yellow zinc dichromate plated Baron Trigger Snap, Round Eye, 90 lb, 3/4 in Snap Opening, 3/4 in Eye Width, 2-1/2 in Overall Length, Steel, Nickel-Plated DO NOT EXCEED the working load limits for chain or components. DO NOT USE for overhead lifting or hoisting. DO NOT USE if the chain or components are visibly distorted or worn. Numerous farm, lawn, and garden and industrial applications. Baron Bolt Snap, Round Eye Swivel, Rigid, 1/4 in Snap Opening, 3-1/2 in Overall Length, Die Cast Zinc, Nickel Plated High quality ASA Standard chain links. Every pin, bushing, roller and side plate is shot-peened during production to increase metal fatigue resistance. Heavy roller chain (i.e. 60H or 80H roller chain) provides extra thickness of side plates which affords greater capacity of shock load without experiencing side plate metal fatigue. Machined form carbon steel. Zinc plated to resist rust. Warning: Do not exceed the working load limits for chain or components. Do not use for overhead lifting or hoisting. 2-1/4 usable inches, zinc-plated.